Tokyo -- Mazda is accelerating a push into electrified vehicles, planning a slew of introductions by 2021 to help avoid European Union fines for failing to cut greenhouse gas emissions. Before that year, the automaker will have to pay penalties because of its high proportion of SUV sales, CEO Akira Marumoto told reporters in Tokyo. The company, which got about a fifth of its sales from Europe last year, will be spared from further fines once its starts selling EVs, plug-in hybrids and mild hybrids, he said. Among Japanese automakers, Mazda is being hardest hit by the regulations with its average CO2 emissions exceeding the EUs targets last year, according to Morgan Stanley MUFG analyst Kota Mineshima. Avoiding further penalties in Europe is important for the Japanese company as it tries to reverse an earnings decline caused by weak global car demand and the floods in Japan this year that disrupted production at its domestic plants. Mazda has been a laggard in expanding into electric vehicles, and a push in Europe helps the company gain a foothold in the burgeoning market. Mazda and rivals are on the hook for total fines in excess of 14 billion euros ($16 billion), should they fail to comply with tighter emissions regulation phased in from 2020 and in full force the following year, according to an analysis by IHS Markit. 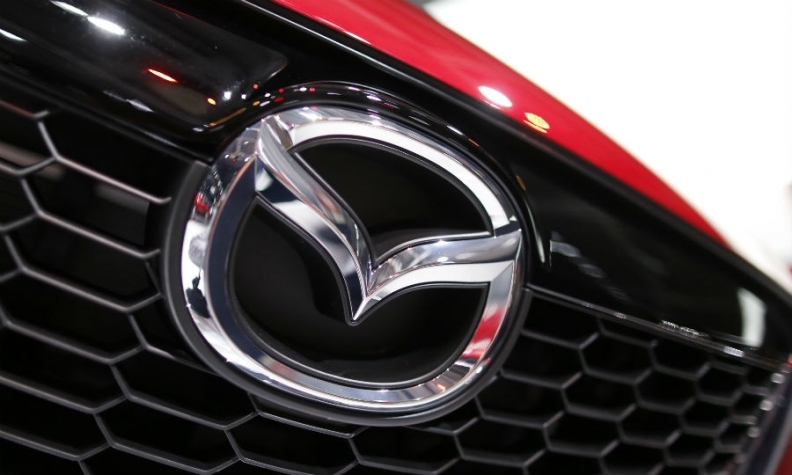 Mazda says it set aside 10 billion yen ($88 million) already this year for the EU fines. Mazda said it will launch a refreshed, more fuel-efficient version of its Mazda 3 compact car, the first model built on its next-generation Skyactiv platform, at the Los Angeles auto show that starts Nov. 30. Mazda last month laid out plans to revamp its lineup, saying all its vehicles will come with electric power by 2030. A majority of the planned lineup will be mild hybrids, in which the electric motor is only able to assist the engine rather than power the car on its own, Marumoto said.